Men love their jewellery - even if we do not always admit to it. My signet ring is way more than accessory now - I love wearing it! Please see our selection of the men’s silver rings. All of them are crafted by our family to be unique, great looking and comfortable to wear. Click on the size on the left to start. If you don't know the size yet click here to see our men's rings - you can find the size later. Engraving is also possible. You can add any text up to 10 characters for fixed £10 price. Examples of texts you can engrave: “21.02.2018”, “Your E.W.” and anything else that carries your love message. You will get the high end product from us. Our family has been making silver jewellery for nearly 30 years and we have thousands of happy customers. 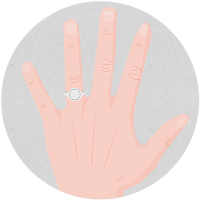 We design and craft the rings ourselves in our family workshop, so we can guarantee they are top quality and very affordable..
Our ring size guide will help you find the perfect wedding rings. And if you order a ring in a wrong size, don't worry, we will exchange it for a different size for free, no question asked! Please note the personalized rings are excluded from the size exchange and returns (they are made to be uniquely yours! ), so we want them to be perfect first time. If you are not sure of the sizes of the engraved ring, then please contact us to order a free ring sizes.